Have you ever been to a St. Patrick's Day Parade (of course you have, that's why you're here! ), looked at those guys in the leprechaun costumes, and wondered, "how the heck do they do that?" Well, you're about to unlock an entire world of leprechaun mystery. Because now you get to be one of "those guys" – the wee leprechauns who seem to be having more fun (and getting more attention) than anyone else marching down the street on St. Paddy's Day! This costume will transform you from head to toe, literally. The set includes an oversized shamrock hat with a stealthy eye mesh so you can see through it (yep, that's how they do it); a "mask" of a leprechaun face that goes over your chest; the classic green tunic; striped knee socks; and even buckles to put on your shoes. 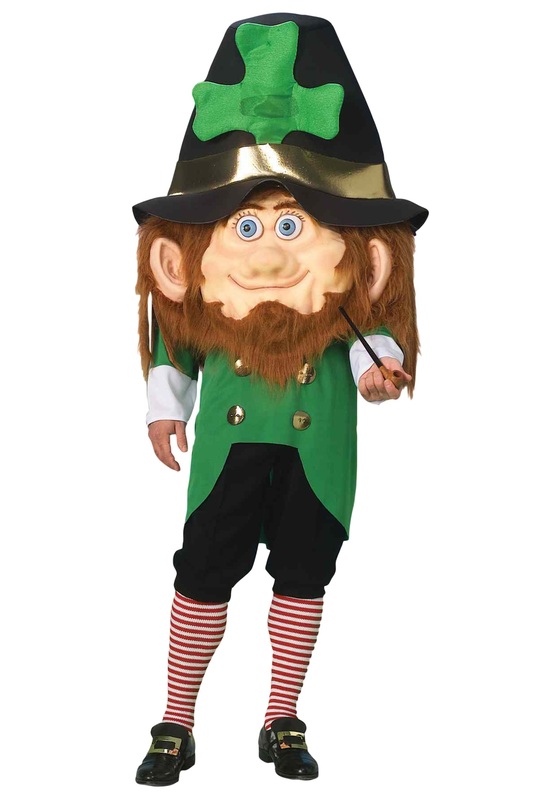 This larger than life outfit is the one-stop shop for all your leprechaun needs, and will make you parade-ready for that big upcoming St. Patrick's Day celebration! But if marching in parades isn't really your thing, the Oversized Parade Leprechaun Costume is also a hit at St. Paddy's Day parties... just be forewarned that as the night wears on, people might think you're the real thing and try to capture you in the hopes that you'll grant them three wishes! Whether you actually want to grant them is entirely up to you, of course. This costume comes with a headpiece hat, chest piece, tunic, socks, and shoe buckles. The oversized hat features a green clover on the front that features a screened oval for the wearer to see out of (that part is important!). The chestpiece face is a semi-flexible plastic that depicts the facial features of the Leprechaun character along with faux hair liberally attached around the sides, top, and back. The green tunic top looks like a jacket and has gold buttons featured at the bottom of the front. You'll need your own pants, and a pair of shoes to attach the buckle accessories to. Then you'll be ready to march in the St. Pat's parade! Excellent quality material, perfect fit and first class delivery.